These are monthly disposable toric lenses with 55% of water and 45% of methafilconA . It is available in powers ranging from -8.0 to +6.0 with cylindrical powers. 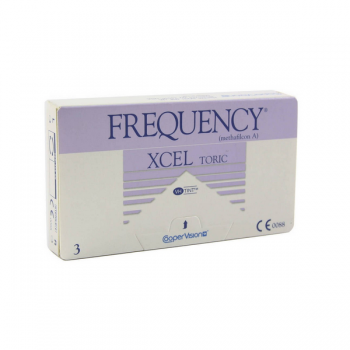 Frequency Xcel Torics XR are suggested for people with high degree of astigmatism. These contact lenses from Cooper Vision are one of the few in the market which cover high cylindrical powers as high as -3.75 with an axis difference of 5 deg steps. But there are other positive features of this good lens. Its unique shape and design makes it perfect on your eye. These lenses will not rotate causing image distortion and blur. Second at the same time the lens needs to be able to move freely on the surface of the eye or it will be uncomfortable. The combination of high comfort in these lenses along with clear vision is what makes this lens so different. There is also a visibility tint in these lenses making it easier for the wearer to spot the lens while taking out or putting in the eye. Frequency Xcel Toric XR contact lenses combine an extremely high level of comfort with the technical capability of a brilliantly clear quality of vision.